The Development With US! Team is a group made up of residents, stakeholders and City staff working toward more diverse and equitable representation of residents in the engagement process. Our focus is on creating a community meeting model which provides a consistent experience to all residents, with information that is easy to access and understand, regardless of where they live, who they work for, or their level of influence. Over the course the meetings the need for a problem statement became apparent in order to continue making consistent progress toward our goal. The existing community engagement process is not engaging communities of color proportionately. There are no minimum engagement standards leading to inconsistent engagement experience for residents. Residents do not know enough about or understand the development process. As a result, the growth of our city, its policies, and key decisions are being shaped predominantly by white residents. A Grand Rapids where residents of all neighborhoods are engaged and people ofcolor are proportionatelyrepresentedin the various stages of the growth and development of our city. 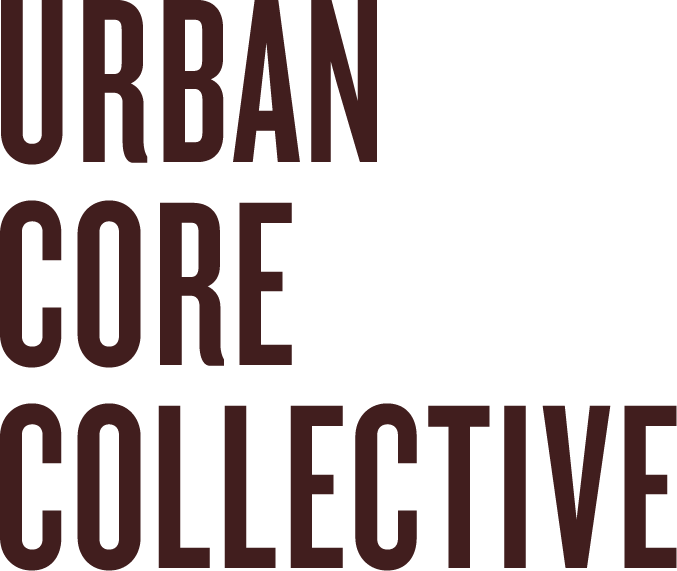 In August of 2016, the Urban Core Collective presented a letter to the Grand Rapids City Commission highlighting disparities in the way the city engages residents of color. It was signed by more than 30 community stakeholders concerned about the racialized outcomes when it comes to engagement, opportunities and the growth that this city has enjoyed in the years since the recession. We asked for communities of color to be included in that growth, and because all communities have valuable knowledge about what is best for them, we asked for all communities to be given a place at the table. Because no one institution can do this alone, we asked that a team be created to evaluate all stages of the community engagement process and develop an authentic community engagement model which involved the input of stakeholders, residents and advocates who were willing. Upon receiving the letter, the City Manager asked the Urban Core Collective to assemble a team with stakeholder and resident representatives from various communities. Since the letter was presented the committee has met monthly to take an extensive look at the state of the current engagement process and analyze all of its areas. Top level officials from the City of Grand Rapids Planning Department have consistently attended. The first six meetings served to build trust between the stakeholders and residents and city officials. The committee members learned about the complexities and challenges of the current engagement process at the city level. Areas of concerned were identified, honest and constructive conversations took place, and a consensus on possible solutions to present to stakeholders and residents for feedback were brought forth. The recommendations were intentionally not well defined in order to allow residents to weigh in considering: whether they are right for community, whether they are sufficient or they over reach, what is missing, and possible unintended consequences. Two community meetings were held, one on November 14, 2017 at Cesar Chavez, in Spanish, and November 16, 2017 at LINC-Up, in English. While the feedback at the Cesar Chavez meeting was favorable, the recommendations were not presented at the LINC-Up community meeting due to resident and stakeholder feedback that they did not feel included in the process up to that point. It was decided to stop the process in order to build trust with community. In response to feedback of residents and stakeholders, team members took the next few months to meet individually with residents and neighborhood associations to get their feedback and invite them on board. The Committee members also attended the Neighborhood Association Collaborative (NAC) meeting where the recommendations were presented. At that meeting 5 representatives were selected by the NAC to join the Development With US! Team. The Development With US! Team meets the 3rd Wednesday of each month from 3-4:30 pm at LINC-Up. Or visit your closest Neighborhood Association, LINC-Up, The Hispanic Center of West Michigan, Baxter Community Center, United Methodist Community House, The Urban League, Family Outreach Center, Grand Rapids African American Health Institute to obtain a hard copy or return your completed paper survey. Individuals or organizations who publicly supports or recommends a particular cause or policy. In this case we refer to resident advocates. City, municipality or county officials, some elected but not all, who make decisions about the community such as the City Commission and Planning Commission. The Grand Rapids Neighborhood associations joined forces to work together and collaborate. They formed this Collaborative.